Once you’re accepted as an NTEN Faculty member and completed an intake process, you’re ready to begin developing your course content and prepare for your virtual class. Please read this FAQ to find answers to most of your questions. Course content must be submitted via the Dropbox upload link sent to you in the introduction/update email. Tip: If you have trouble with your Dropbox link for any reason, you can submit content via email. Typically the deadline to submit course content is 30 days before the course is published. This gives us time to review all content and finalize any changes necessary. Courses are published and released to participants the Thursday prior to the live virtual class. Participants complete pre-work to help them explore course concepts. Includes a knowledge check quiz. Live virtual class builds on pre-work and sets the stage for the homework assignment. Includes interactive classroom content to engage participants. The class is recorded for participants to access on-demand. Participants complete the homework assignment and submit it to faculty. Faculty provides feedback on participant’s homework. Update: NTEN has a new logo! All course templates have been updated with the new logo. Update: Additional resource guide is now required for all courses, and is no longer optional. Update: templates have been updated with NTEN’s new logo. Added to the Virtual Class section: Pitfalls — It’s best not to date your title slides as you may wish to reuse them for more than one cohort. Adobe Connect: The platform used for the virtual classroom portion of all NTEN courses. Community forum: An online forum platform used for group discussions between participants, Faculty, and NTEN staff on courses which are a part of the 10-week Certificate core program. Note: The group discussion platform is not used for the stand-alone courses NTEN offers outside the Certificate core program. However, we plan to make group discussion available for those courses in the future. Adobe Connect is NTEN’s virtual class platform. It’s used to host classes in a way which offers flexible content and opportunities for interaction between both faculty and participants. An installed plug in is required for faculty and presenters to access the presenter features of the platform. All NTEN faculty and presenters are required to test their browser and network connections for compatibility and install the plug-in if necessary at least one week prior to the live virtual class date. Getting access to the live virtual classroom is easy. Simply navigate to the URL sent to you by NTEN’s Education team in the email reminder prior to the scheduled live virtual class. No passwords are needed to access the web portion of the virtual class. 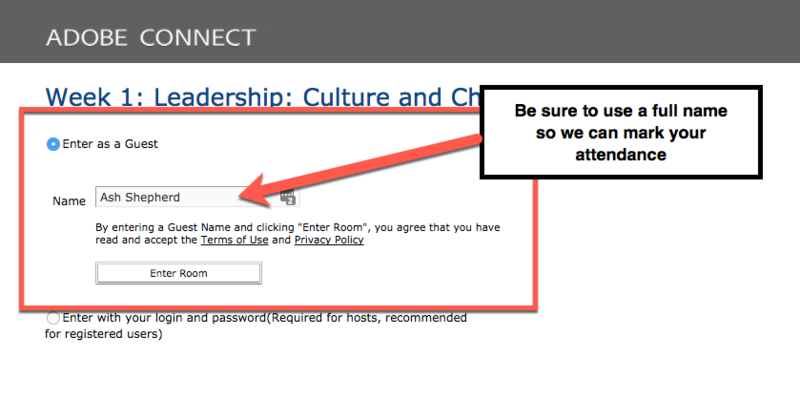 Just “Enter as a Guest” and use your full name. Then call the phone number provided in the reminder email to access the class audio. Again, no pins or access codes are required. Once the NTEN host has identified you, they’ll promote you to a presenter. This will change your view from participant to the presenter perspective within the platform. Adobe Connect features and uploaded course content will become available. The NTEN host will handle any technical issues and troubleshooting that come up during the course. The NTEN host will announce the start of class, walk participants through housekeeping announcements, and start the recording before turning the class over to the presenting faculty. The NTEN host will help the faculty transition between the interactive elements of the class such as live polls, Q&A, open peer-to-peer chat, video, and audio content. The faculty is expected to engage with participants via the live open peer-to-peer “Classroom Chat,” answering questions as they come up and responding to relevant comments coming in from the participants throughout the live virtual class. The faculty will turn over the class to NTEN’s host before the scheduled end time. The NTEN host will end the class with course reminders and stop the recording. Remember: Installing the Adobe plug-in is required and available here. If you’re teaching a course as part of our Certificate Core, you’ll have access to a community discussion group set up for the course. The discussion thread is where faculty will monitor and respond to participants questions, comments, and feedback related to the course. Go to community.nten.org. If you’re not already logged into your NTEN account, you’ll be redirected to do so. Once in the Community Discussion, go to Communities in the navigation bar, then My Communities. You will now see a list of groups you have access to and will see your specific cohort in the list. There is a fairly robust Help FAQ resource as well as an explanation of our Community Guidelines. Faculty develops course content in collaboration with the NTEN Education team far in advance of the scheduled week of the course. Faculty develops course content: 60 days from class date. Faculty submits course content to NTEN: 30 days from class date. Course content revisions are finalized: 2 weeks before the class. The course is published: Thursday before the class. Following the course release, faculty works with NTEN host to produce the live virtual class. Following the virtual class, homework is due to faculty from participants by Sunday night. Faculty will respond to participant homework through email with their feedback by the next Sunday. Tip: It’s important to remember to use “reply all” when responding to homework. This ensures NTEN’s Education team can track homework completion. The first step in developing content for your course is to identify three skills participants will gain through participation in your course. These are included in your course description and help establish participants expectations on practical takeaways. From there the content and interactive elements of your live event can be crafted to ensure those skills are reinforced. Identify a skill and provide a sentence describing how that skill will be gained within the context of your particular course. You will need three of these combinations in total. The following is an example of what a combination might look like. Participants will learn how to map their goals against specific strategies within the context of a campaign timeline. You can see an example of what this looks like on a current course description here. Below are example skills but you can also identify your own. Course pre-work is an important learning primer before the virtual class. Participants should gain a high-level overview of the topics being presented in the class. Pre-work should include 1 to 3 articles of relevant media content and should not take participants longer than 30 minutes total to work through. Pre-reading: Should be short articles, blog posts, reports, or other reading material. If using blogs or other online articles, please strip out all extraneous advertising, branded headers, and menus. Must be an Adobe Acrobat 9 or higher compatible PDF or Word Docx. NTEN’s logo should be placed at the top right of the document header. The main source must be cited at the bottom left in the footer of each page. The font should be 14pt Arial. Use this template to format pre-readings. Audio & video can be used as alternatives to or in addition to pre-readings. Check which formats are compatible with our virtual class platform. Make sure you include sources for your content and original URLs cited if pulled off the web. Content from Youtube and Vimeo is compatible as well, just put the URL in the course inventory document to be submitted. Every course requires a knowledge check quiz based on the pre-work. This is an ungraded quiz designed to reinforce key concepts from the pre-work readings, video, or audio. The quiz should have 3 to 5 questions with clear right and wrong answers quoted from the pre-work itself. Questions must touch on key concepts drawn from the pre-work materials which tie into the live class and homework. Please include the knowledge check quiz questions and answers in the course inventory document. Note which pre-work articles, videos, or other media the question is pulled from. Remember to highlight or clearly mark the correct answer(s) for each question. What formats should not be used to create pre-work for an NTEN course? Interactive elements for the virtual class should include multiple media formats including polls, files for download, audio, and _____. Courses and webinars are the same things. What formats should be used to create pre-work for an NTEN course? Faculty will prepare a slide presentation for the virtual class portion of the course. Participants will receive more in-depth instruction expanding on the pre-work and building a framework for the course homework assignment. Use placeholder slides consistent with the presentation theme for transitioning to media content, interactive elements or Q&A breaks. It’s important to make sure these are easily identified visually. Object layering, slide transition animation, and image masking are not compatible with the virtual class platform. Object animations work best if each animated frame is flattened into its own slide. It’s best not to date your slides as you may wish to reuse them for more than one cohort. Faculty will prepare interactive elements for the virtual class portion of the course. These serve as opportunities for faculty and participants to engage with each other and reinforce learning during the class. Watch a short explainer video on designing your class experience. A minimum of 3 interactions is required per class, with no more than 6. The 3 minimum interactions work best if they are spaced out evenly during the class, about every 30 minutes. Insert placeholder slides consistent with the slide theme for interactive elements. It’s important to make sure these are easily identified visually. Outline interactive elements with slide numbers in the course materials inventory. Interactive elements are available to mix it by using the following formats. Keep in mind longer format audio and video can be used as a part of the course pre-work module. If using URLs pointing to content, make sure they are not behind a pay wall, or email opt-in. Make sure copyrighted content you’re using falls under Fair Use. Polls are an engagement tool used during the live virtual class. They can be used as a fun interaction in the lobby while participants wait, as an ad hoc pop quiz, or as space for participants to share feedback with Faculty and peers during the class. Every course is required to have a minimum of one and a maximum of two lobby polls. The purpose of a poll is to engage participants while they wait for the class to start. Additional polls can be used throughout the class as one of the requirements for interactive elements. Both poll questions & answers should be limited to 50 characters including spaces. Make sure you have placeholder slides in your presentation for any polls you wish to use during the class. Include your poll questions, answers, and placement in the course materials inventory. Audio clips can be used either as part of the pre-work or as an interactive element during the virtual class. Audio clips are a valuable learning tool sourced from sound bites or podcasts relevant to the course learning objective. Audio file formats must be .mp3 or a URL such as Soundcloud or Youtube. Maximum length of the listening experience during a virtual class is 5 minutes. If used as part a standalone pre-work module, they can be as long as 30 minutes. If used as an additional resource not required for the course, there is no limit on length. However, audio clips longer than 30 minutes is not recommended. Video files can be used either as part of the pre-work or as an interactive element during the virtual class. Videos are a great way to make your class experience more engaging and are an effective learning tool. Faculty are encouraged to consider including video content relevant to the course. Video file formats must be a compatible format or a URL such as Vimeo or Youtube. The maximum length of a video experience during a virtual class is 5 minutes. If used as an additional resource not required for the course, there is no limit on length. However, video clips longer than 30 minutes are not recommended. Homework is intended to reinforce the key concepts reviewed in the pre-work and expanded on in the live virtual class. Homework should take the participant no longer than 30 minutes to complete. Limit homework tasks or project elements to 3 or fewer (keeping in mind the 30-minute time limit). Use questions that help the participant reflect on and apply key concepts to their personal or organization’s situation. Use practice templates for participants to complete using the insights and concepts they’ve gained in the pre-work and virtual class. To reiterate, the homework should be tied directly to the content of the live class. All homework assignments must be made available in a widely available and editable format such as Microsoft Excel or Microsoft Word. NTEN’s logo should be placed at the top right of the document header of word documents. The font should be 12pt Helvetica or another similar web safe font. Examples of homework used by some of the NTEN faculty. Editable PDF forms may present challenges for participants, as there is a wide range of compatibility issues across operating systems. Do not use zip files or any other compression when submitting content as this can result in corruption or loss of formatting. Additional resource guides are an opportunity to share content that participants can consume outside the course and are suggested but not required. This is a good place to include media that may not meet the course requirements such as a long video, an entire website, etc. Including this document is encouraged but not required. Many participants find it extremely insightful and useful. Submit your additional resource guide as a Word doc or PDF using our additional resources template. Don’t forget to put your course title at the top. In order to keep all the moving pieces of your course together, it’s important to include a course materials inventory when submitting your course content. You’ll receive an email with a Dropbox link to upload all the required course materials by the course deadline. Between cohorts, Faculty will be able to view archived content and make updates. Faculty are encouraged to create an intro video for their course using the NTEN Stories. This video will help us illustrate the value and scope of our online courses. It’s a prime opportunity to share how your expertise, topic, and takeaways will be beneficial to participants. The video may be featured in our course emails, on NTEN.org, and on NTEN’s social media accounts. Faculty who complete an intro video can receive a $150 incentive. Simply add “video promo” as a line item to your next invoice once you have recorded it. Log in to the NTEN Stories app. Click “Submit your story,” select “Nonprofit Technology Faculty,” and follow the prompts to create a short video (:30 seconds is perfect!) for your course. Once you submit it, we’ll review it before publishing. The Education team is available by email or phone to answer your questions and offer support where needed in the process of developing your course content. The Education team will share feedback from participants for each course within 2 weeks after the course has ended. We also welcome your feedback as well.